Nine people were killed Sunday and some others injured after a shootout erupted among rival biker gangs at a Central Texas restaurant. 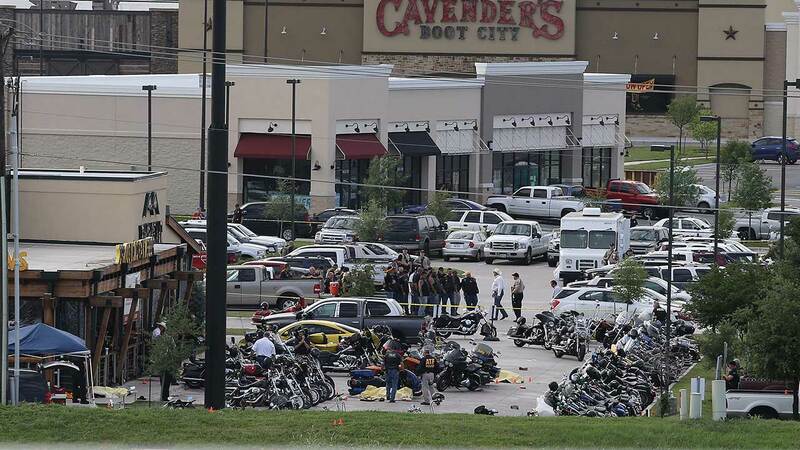 WACO, Texas -- A shootout among rival motorcycle gangs at a popular Central Texas restaurant left nine bikers dead and 18 injured, and it sent panicked patrons and bystanders fleeing for safety, a police spokesman said Sunday. The violence erupted shortly after noon at a busy Waco shopping center along Interstate 35 that draws a large lunchtime crowd. Waco police Sgt. W. Patrick Swanton said eight people died at the scene of the shooting at Twin Peaks restaurant and another person died at a hospital. The nine killed were all members of biker gangs, he said, as were the 18 people who were taken to hospitals with injuries that include stab and gunshot wounds. Some victims are being treated for both, he said. "This is probably one of the most gruesome crime scenes I've ever seen in my 34 years of law enforcement," Swanton said, later adding, "I was amazed that we didn't have innocent civilians killed or injured." At least 100 people have been detained for questioning, Swanton said late Sunday night. Swanton said at least five rival gangs gathered at Twin Peaks for a meeting that he said focused on turf and recruitment, two areas where the groups have often clashed. Preliminary findings indicate a dispute broke out in a bathroom, escalated to include knives and firearms and eventually spilled into the restaurant parking lot, he said. There were 150 to 200 gang members inside the restaurant at the time. Shots were fired inside and outside the restaurant, he said. Swanton described the interior of the restaurant after a Sunday night walk-through, saying it was littered with bullet casings, knives, a club, bodies and pools of blood. Authorities would be working the rest of the night to process the reams of evidence, he said. Police were aware of the meeting in advance, Swanton said, and at least 12 Waco officers in addition to state troopers were outside the restaurant, part of a national chain that features scantily clad waitresses, when the fight began. "We've been made aware in the past few months of rival biker gangs ... being here and causing issues," Swanton said. Swanton said that the restaurant's operators also were aware of the meeting in advance, and he described the management as uncooperative with authorities in addressing concerns. A statement sent Sunday night on behalf of Jay Patel, operating partner for the Waco franchise, said, "Our management team has had ongoing and positive communications with the police," and added that the restaurant was cooperating with the investigation. Swanton addressed Patel's statement late Sunday night, calling it a "fabrication." Van Warner said he couldn't address what the franchise owners "did or didn't do leading up to this," but added that the company is "very upset that clearly our standards of safety and security were not upheld in this particular case," he said. Doug Greeness, a biker from Belton, Texas, was near the scene Sunday evening. He said he's a member of a family riding club and was waiting for friends to be released from custody so he could return home. Greeness, who was not inside the restaurant when the melee broke out, described the event as a meeting of a biker association called the Texas Confederation of Clubs and Independents. He said the group meets to "discuss issues within the biker community." Officers with numerous law enforcement agencies were seen parked along the service road for I-35 near the city and were stationed in several points in downtown Waco around the local convention center. Swanton said authorities are increasing security in the area to prevent further violence among the gangs.